This weekend, a friend's gallery opening took me out to Coraopolis, a neighborhood outside of Pittsburgh that I don't get to often. 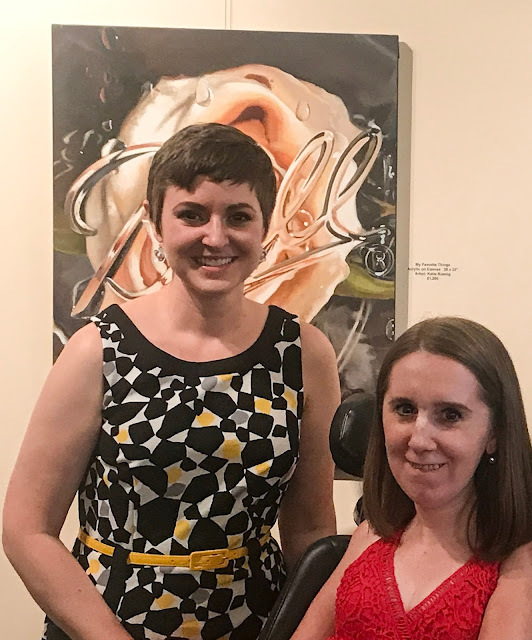 It was her first solo show at a gallery, and I am so proud of her! She does hyper-realistic art - her paintings basically look like photographs, which is incredible. You can check out her Etsy site here to see more of her amazing work! Since we were in the area - and because it was my parent's anniversary! - my family went out to dinner at the Hyeholde. The Hyeholde is an institution - it's been around since 1938. It's owned by the daughter of the original owner, and the building is beautiful - it really has so much old-world charm. The dining room is small but exquisite, and the food was all beyond amazing. The Hyeholde has a no cell phone policy in the dining room, which was actually really refreshing, but it means I don't have any pictures to share! I did snap this picture quickly outside, though. I picked up this red dress from ASOS earlier this summer, but had to find the right occasion to wear it. 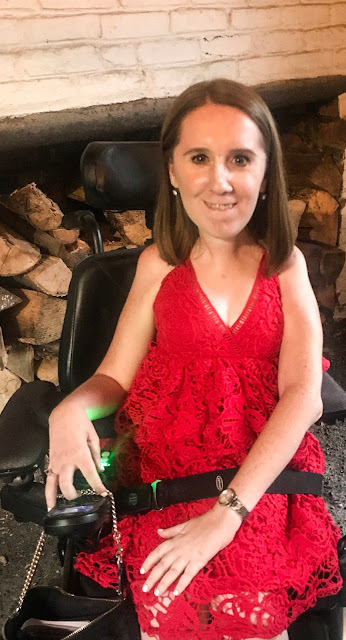 I love the lace, and the peplum detailing - it works well for me because it gives me a little extra room around my feeding tube, which I appreciate. The color is nice and bright and perfect for the end of summer. You can find some other similar bright lacy dresses below! I also went to Eighth & Hays for dinner to celebrate a friend's birthday. Eighth & Hays is a new pizza kitchen/wine bar opened in Homestead, really near to the Waterfront, a big shopping center. 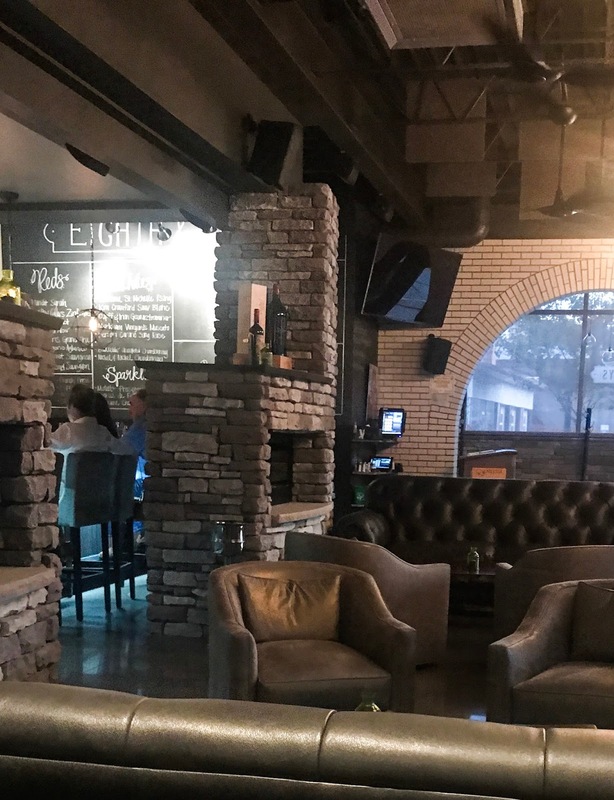 It's a 21+ restaurant, with a small but frequently-changing menu. 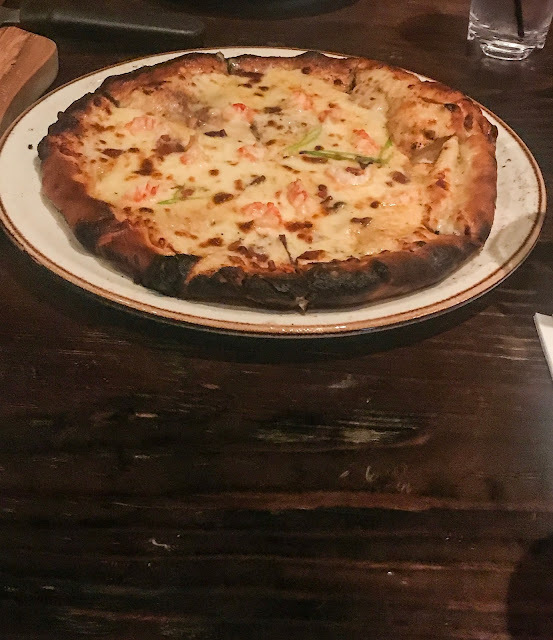 They have some unique appetizers and pizza choices - I was especially excited for the lobster pizza! The interior is small, but cozy, and I can't wait to go back in the winter when the fireplaces will be roaring.